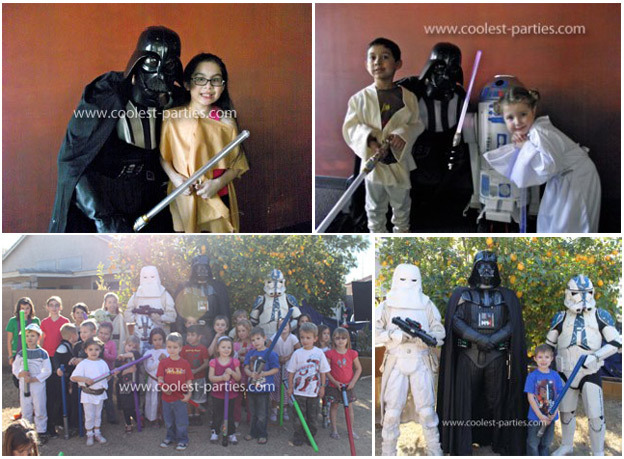 You don’t need the powers of THE FORCE to create a Star Wars birthday party! “8 years ago in a galaxy far away, a boy was born, his name is Jarred, and he is strong with the force! His Jedi training is progressing well, but he needs the help of others. A call is sent out for other brave younglings to learn the way of the Jedi. You have been chosen to join forces with Jarred and the Jedi. If you are up to the challenge, make your way to: (place of party). MAY THE FORCE BE WITH YOU!” RSVP to the Jedi Council”. Please join us for Jedi Billy’s Star Wars birthday party as he fights the dark side of the force! You are invited to a galactic adventure with Anthony! You’ll take part in Jedi training and go out on your mission to rescue and protect Princess Leia, as she has been taken prisoner by Darth Vader! In a galaxy not so far away, in the year 2004, a baby was born. From the beginning, his energy and strength drew the attention of the Jedi council who named the child John Smith. In the 6 years following his birth, young John learned the powers of the force. In recent time, the Jedi knights have felt a disturbance in the force generated by the dark side. The Jedi council have called upon young Padawan John to seek out future Jedi. Your presence is requested to complete this very important Jedi training! You’re invited to an ‘out of this world’ Star Wars birthday party! Attention Jedi Warriors! May the force be with you as you make your journey to a galaxy far far away! Nathan will be named a Jedi, marking his 7th birthday. 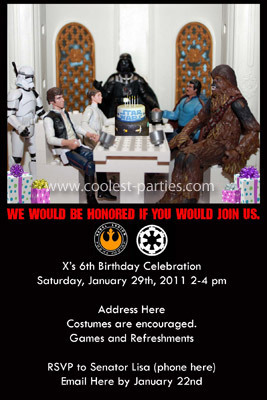 The galactic council requests your presence at his Star Wars birthday party! In a galaxy far, far away, on the morning of (birth date), a baby was born. The Jedi Council named him Jamie and they knew he was the chosen one. In the 7 years that followed his birth, young Jamie has been learning the powers of the force. Meanwhile, the republic discovered a new enemy. The Jedi knights felt a strong disturbance in the force. Fear, pain and suffering have opened the path to the Darkside. Many Jedi Knights have been lost. The very future of the Jedi Order is now in jeopardy. Young Padawan Jamie has been called by the Jedi Council to seek out future Jedi. Master Yoda is urging the younglings to complete their training and take part in the upcoming trials. Padawan (guest’s name) presence is requested to complete his/her Jedi Training and prepare for the trials on (date). Transport to the Jedi Temple on Coruscant, will be departing promptly on (time) from the (your last name) System, Docking Bay (address). Please advise the Jedi Council as soon as possible at (phone number) whether Padawan (guest’s name) will accept the challenge of the trials. May the force be with you! You can download this free Star Wars font called “Distant Galaxy” (the main Star Wars font) and use it for your Star Wars birthday party invitations. With each invitation, it could be a nice extra touch to add star confetti, a few glow in the dark stars, Star Wars magnets, stickers, and/or tattoos, etc. Here are two different Star Wars logos you can use on your Star Wars birthday party invitations. Another simple idea is to use black paper and stick star stickers all over it to look like outer-space, then write all the info on the back. If you have the time, patience, and adventure in you – a really cool Star Wars birthday party idea is to create a short movie clip burned on a DVD with the invitation. Have someone dress-up as Darth Vader or any other Star Wars bad guy, and then play out a scene that shows that Princess Leia has been captured (or anything of the sort). At the end of the small movie clip the kids need to know that they must go on a mission and arrive at your child’s Star Wars birthday party (add all the needed party information as well). If you don’t have a video camera, you can also create a CD. Take a known song from one of the Star Wars movies and record yourself talking with a Darth Vader voice (or any other character of the Star Wars movie) with the music (tape yourself loud enough so that whoever is listening understands what you’re saying). You’ll need to hand-deliver these invitations. For a cool Star Wars look at your Star Wars birthday party, use colors like black, gray, white and silver for balloons and streamers. 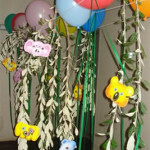 Hang crepe streamers from the doorways for a little added mystery. Hang black industrial plastic all around (on walls, doors, etc.) and change all the light fixtures to have colored light bulbs (like red, blue and green). Disperse as many Star Wars toys and items all around the Star Wars birthday party area, use as table centerpieces, hang from the ceiling or even attach helium balloons to each Star Wars item. It would fit to use black table covers and glue on stars all over them. Have placecards on tables with the guest’s names – plus add the word “Padawan” or “Jedi” before their name. Here are blank placecards you can use. You can also create Star Wars-related signs around the party area, like “May the FORCE be with you!”, “Secret Jedi Training Camp”, etc. Print out Star Wars pictures from the Web and hang all around your party area. You can split up the Star Wars birthday party area by decorating two different sides or two different rooms, one as the ‘Light’ side and the other as the ‘Dark’ side. The light side should be decorated with bright and light colors and with the ‘good-guy’ characters, posters of Luke Skywalker, etc. The dark side decorated with black and dark colors as well as posters of Darth Vader, and other bad guys. If you don’t want to buy printed Star Wars paper goods, you can just use black paper plates, cups and cutlery, then add a few Star Wars stickers here and there. 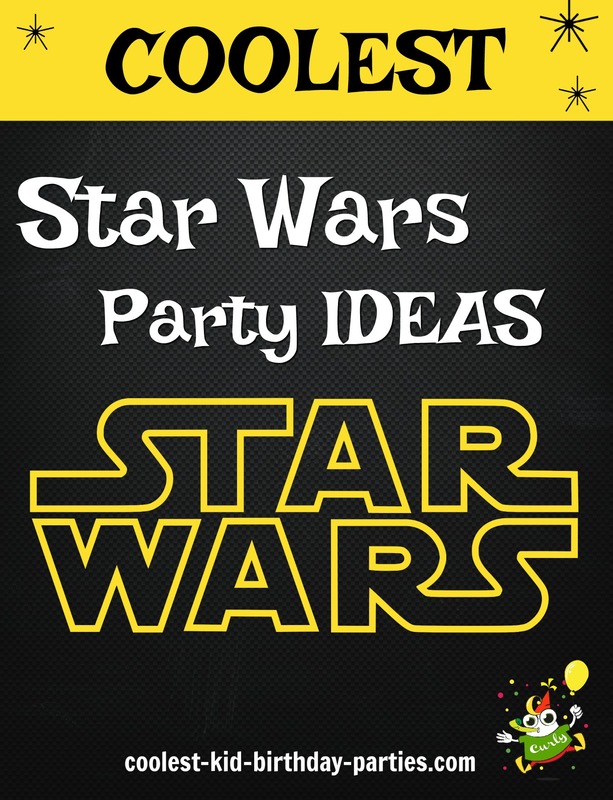 Decorate the whole Star Wars birthday party area with glow-in-the-dark items, stars all over the ceiling, hanging planets (simply painted foam balls) and toy spacecrafts using fishing lines. Planets can also be made by cutting out moons, stars, and other planets from fluorescent poster boards. Punch holes in the planets and hang them from the ceiling. You can take regular rocks and paint them with glow-in-the-dark paint, then disperse them in the party area as moon rocks. Blacklights can add that ‘space-y’ look, even if only one designated room has blacklights in it. Everything that is white under a blacklight glows and the kids’ll get a kick out of seeing their teeth and the white in their eyes glow! Consider having a fog machine for that heavy and dusty mysterious mood. Also, music can get everyone in the mood. Make a music CD with all kinds of Star Wars songs from all of the different movies and have it play throughout your Star Wars birthday party. A cool idea is to rent out a “martial arts” studio so the kids could practice their Jedi training on floor mats as well as use the equipment of the martial arts studio. Take a look at all the coolest homemade Star Wars costumes. Once the kids arrive at your Star Wars birthday party, you can have a suitcase with all kinds of Star Wars costume accessories they can wear (masks, wigs, hair accessories, etc.). For the capes simply use plain brown fabric and just tie around each of them (if you find brown bathrobes they will work too). Other items that may be suitable are little compasses (to help them navigate their way through the Solar System), light sabers (long colorful balloons, pool noodles with silver duct tape on the ends or light sabers made out of soft foam tube pipe insulation). To hype up the energy, get the whole family to dress up as Star Wars characters! Even invite a few friends to come dressed up as well. If everyone is dressed up it will really make a big difference! A really cool Star Wars birthday party activity is to create your own Mustafar Volcano! We’ve written a whole page on how to create a homemade erupting volcano, the kid’s will have a blast with it! Using special face paints, give each birthday kid a unique alien face. They can make up an alien name for themselves or use names from the movie (“Gondar”, “Zork”, and “Murblap”). This is a simple and fun activity for your Star Wars birthday party. Give each Padawan one piece of foam pipe insulation (can be bought at Home Depot, they usually come in packages of 4 and are of a black/dark gray color). Have all kinds of neon-colored duct-tape for the kids to choose from. Let them decorate each light saber by wrapping the neon-colored duct tape around the pipe. Each Jedi gets a baby food jar (or any other little jar, clear water bottle, etc.). Have an adult show them how to make them, adding star-shaped sequins, glitter, water, baby oil and blue food coloring to each jar/bottle (you can also add a bit of black food coloring to create a darker mixture to look more like outer-space). If it’s a jar large enough, you can hot-glue a bottle cap to the bottom of the jar lid (from the inside) and on top of that hot-glue a small Star Wars minifigure (the bottle cap makes the minifigure taller). Then when you close the lid of the jar the minifigure is in the Star Wars space globe. It’s best if an adult secures each of the jar/bottle lids with hot glue so that the space fluid doesn’t leak. A great and fun activity for holding Star Wars space in your hands! Take a look at all the coolest homemade Star Wars birthday cakes. Another easy and fun idea is to create a Lightsaber Cupcake Cake (or even a few of these). For each lightsaber use around 6-8 cupcakes frosted with light green, light pink or light blue frosting (for the top part of the light saber), and around 2-3 cupcakes frosted with gray frosting for the handle of the light saber (add a few colorful M&M’s to the gray-frosted cupcakes to look like colorful buttons). Then fit them all together in a line, and voila! A long edible light saber! Another simple Star Wars birthday party cake idea is to create a “Light and Dark Side” cake. Just use a regular rectangular cake, frost half with white frosting and the other half with chocolate frosting. Then take good guy Star War figurines and put on the light side and bad guy Star War figurines and put on the dark side. Remember to wash the figurines well before putting them on the cake. It’s even better if you create half of the cake to be a vanilla cake and the other half to be a chocolate cake. The easiest Star Wars birthday party cake is to create a regular rectangular cake, frost it and put a Darth Vader mask on the top of it (make sure the mask is super clean before you put on cake). Storm Trouper Souper – soup! Tip: You can have two tables serving food in a “Light vs. Dark” theme. On one table you’ll have a white tablecloth and all the Star Wars birthday party foods that are from the ‘Light Side’ (represent the good guys), and on the other table a dark tablecloth representing the ‘Dark Side’ (all the bad guys). For example chocolate for the Dark Side and vanilla for the light side. Yoda Soda – mix Lime Sherbet with Sprite or 7-Up, a real fun and fizzy surprise! Take a punchbowl and fill with half a gallon of lime sherbet. Then pour over a chilled 2 liter bottle of Sprite or 7-Up (must be served immediately!). If you create this yummy fizzy punch in a clear bowl, it will take on a science fiction glow if it’s set upon a few glow-in-the-dark necklaces and glow-sticks! Tip: If you are serving drinks from soda/juice bottles, it could be really cool to print out your own Star Wars labels for the bottles (each bottle with the special Star Wars name). Download Star Wars pictures and add the name of each Star Wars drink to the label. We have created these printable and foldable favor bags and favor boxes. They are blank and so the kids can decorate and fold them themselves. You can also print them out on different-colored paper, possibly the color/s of your Star Wars birthday party. You can let the kids decorate them with Star Wars stickers as well. If you don’t want this to be an activity for the kids, create them before the party. We’ve created large favor-bags, medium favor-bags, and favor-boxes for you to print out. For the favorbox and medium favorbag printables, color if needed (or print on colored paper) and cut out. Before you start gluing the favor box, fold along the dotted lines and assemble so that all the sides connect. Only then add glue and secure the folded flaps. To create the large favorbags you’ll need to print out TWO designs for one favorbag. First, cut along the lines and fold along the dotted lines. Then, connect the two so that the left side of one is glued to the right side of the other (if the kids want to color any of these printables, let them color them before cutting and assembling). It’s also a nice idea to give out Star Wars certificates at the end of the party (certificates for completing Jedi training). On each certificate you can write something like “The Jedi council of the (your last name) Galaxy presents (child’s name) the title of Jedi Master in recognition of your excellence and bravery in fighting the Dark Side and defending the galaxy!”. At the bottom write “Yoda” and right by make up a signature you think Yoda would have. With every certificate it’s nice to also give out gold medallions. You can either purchase them or create them yourselves by cutting out round cardboard circles and spray-painting them with gold spray-paint. Then, on each medallion, write the word “Jedi” and the child’s name right after. Before each kid leaves, give them a Star Wars certificate and place one of these gold medallions around their necks while saying “Congratulations Jedi (child’s name), you have completed your training and now you are a true Jedi!”. If you really want to go overboard, you can create a whole ceremony at the end of the party, where the kids wait in a line and are awarded one by one while exciting Star Wars music is playing in the background. You can create a whole Star Wars galactic treasure hunt and have the favor packs be the treasure at the end. In each favor pack you can put glow-in-the-dark necklaces and bracelets, pop rocks, star cookies, Star Wars stickers and tattoos, Star Wars masks, Star Wars music, etc. Another special thing you can put in each favor pack is a personalized Star Wars puzzle. If all the guests are in costume, make sure to photograph each and every guest, that way you can send them a picture with the thank-you cards. 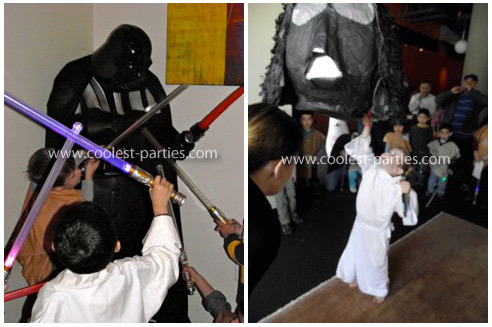 Pinatas are also a fun activity for a Star Wars birthday party. The kids can try hitting the pinata with their light sabers! (most likely the light sabers won’t be hard enough to break a pinata, so after a few fun tries, you can give them something a bit harder to hit the pinata with). You can make a cool homemade Darth Vader or Death Star pinata by using a big round punch balloon as the shape. Check out this page on how to create a homemade pinata. After creating the homemade Death Star pinata, spray-paint it gray and add a black line around to look real. An easier idea for creating a Death Star pinata is to buy a large soccer ball pinata and paint the white areas of the soccer ball with gray paint – works great! Another nice idea is to make the gift-opening “ceremony” a Star-Wars activity. Everyone can sit in a circle holding the gift they brought for the birthday child. Then, one by one, each person gives the birthday child the gift they brought while telling everyone who their favorite Star Wars character is and why, and which Star Wars movie they liked best. This lets everyone at the party feel special and lets them share their thoughts and feelings. 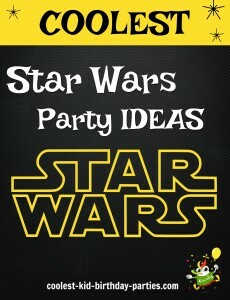 Lots of visitors from around the world have contributed their Star Wars birthday party ideas to this site! Have a great Star Wars birthday party! May the FORCE be with you!